Being back in the US has given us a chance to catch up with family and friends who inevitable asked us questions about our 6 month trip to South America. Colombia? The food is not much to talk about. The bus rides will probably kill you. Other than that traveling in Colombia is just as safe as any other countries we went to in South America. Or as dangerous. Depending on how you look at it. The Colombians themselves, though? Ah, beautiful people. First they try to freeze you to death by cranking the AC to the max. Simultaneously they try to give you brain aneurism with back-to-back showing of the most violent movies Hollywood has ever come up with. The worst we saw was about a serial killer who do unimaginable and most horrendous things to women before killing them in cold blood. Seriously? If all of that fail, there’s the driving: the constant stop and go and the general giddy recklessness. I have to say that the more religious paraphernalia a driver has in his cabin the more worried we became. It always makes me think that it’s the driver’s way to show that he’s not afraid to die. And the vomiting. We know it’s a common occurence because the bus assistant would give out plastic bags to everyone in the beginning of the trip. Big cities tend to be where most crime stories happen. In any big cities such as Medellin, Lima, Quito – there will be parts of the cities that are safe and there will be areas that’d be wise to avoid. I know the general adage is to ‘go off the beaten path’ – but for us, we tend to stick to the tourist areas in big cities. – Really do try to stay in hostels where you need to be buzzed in to enter. 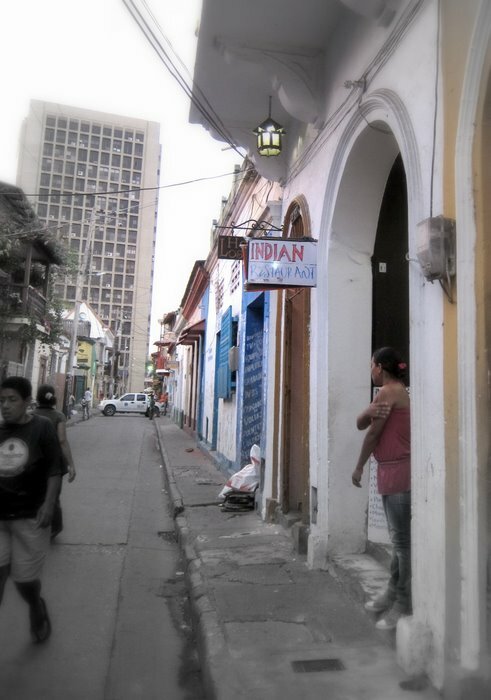 When we were there, there was a string of armed robberies that happened in Cartagena and Bogota hostels. – If you’ve had too much too drink, wait until you sober up to go home or call for a cab from inside the bar. – When in taxi, avoid temptation to use flashy electronics and roll up your windows. 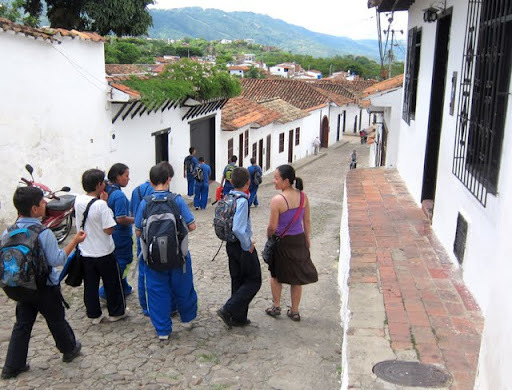 If you consider visiting Colombia and only have a limited time, consider the ‘paisa’ region: Medellin, Salento, and the pueblos in the region. It is a mountainous region (see leading pic) filled with beautiful scenery, trout-bearing rivers, and the friendliest people you’d meet in the whole continent. 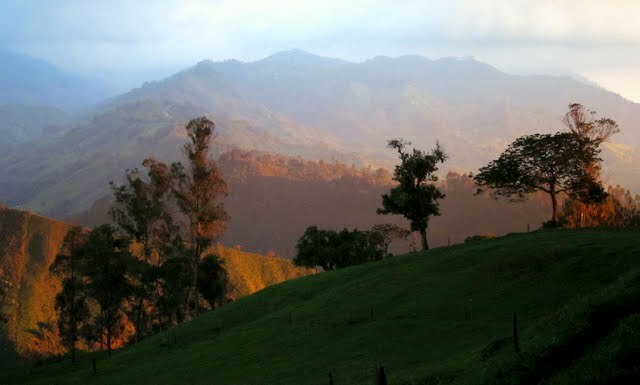 Definitely do not miss Salento and its famous Valle de Cocora. 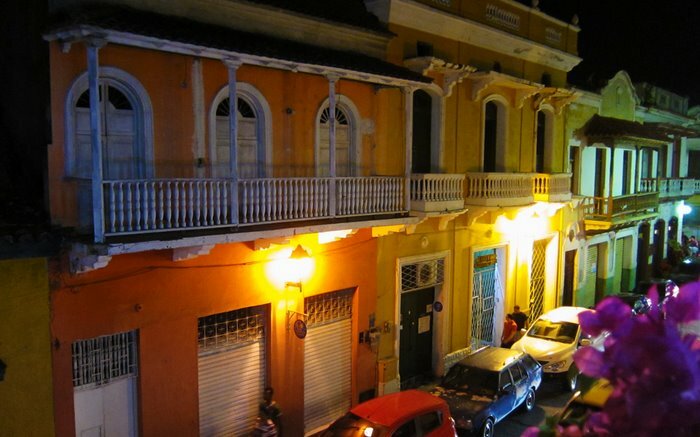 And if peace and natural beauty is your thing, check out Colombian pueblos – little towns filled with beautiful houses that exude charm and laid-back vibe. 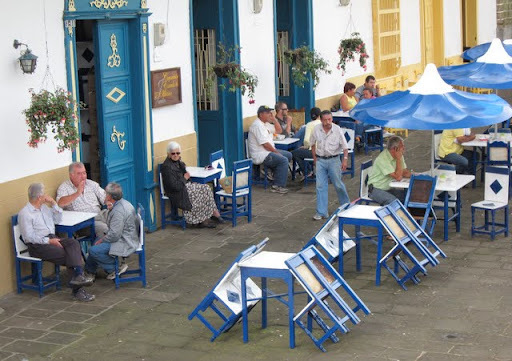 Visiting pueblos such as Guatape or Jardin was definitely the highlight of this country for us. English is little spoken here. Learn a little Spanish before you come, or get really good with drawing sketches and hand gestures. Many people love it. Jack and I differ in opinions about this colorful colonial city. I thought it was nice, Jack not so much. It’s beautiful alright, but it’s hot and at times – a little dodgy in some parts. If you go, we recommend staying in either San Diego or El Centro neighborhood which is closer to the city’s center than Getsemani. Is Colombia ready to shake off its drug lord overrun image? We think so. Just to give you an example based on our own experience, we never got creeped out by a city until we got to Ecuador (Quito), we didn’t get scammed until we got to Peru, and we didn’t get our stuff stolen until we got to Chile (Iquique). So in retrospect, Colombia was the only place where nothing negative really happened to us. Not to say that crimes to tourists do not happen in Colombia (read our friend’s account of getting robbed in the street of Medellin). But it’s not that Colombians lurk in every single dark corner ready to rob every single tourist that visit. It’s quite the opposite, really. Crossing over the Ecuador, we were definitely relieved to find more food options, but oh, how we missed the warmth and the smiles of the Colombian people we had left behind. 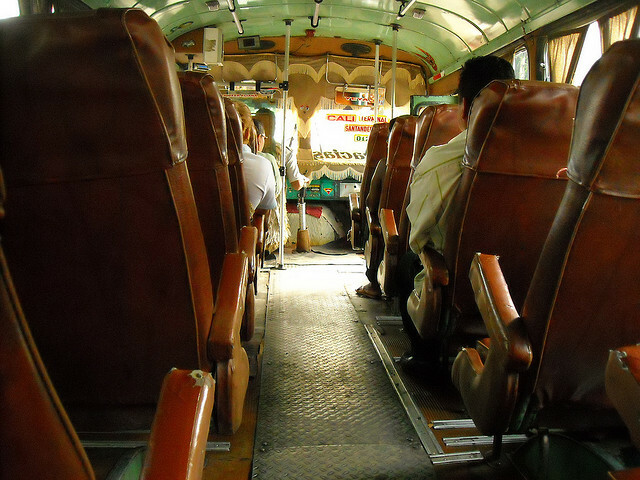 The Mexican buses that operate audio visual systems feature largely nonstop loud, graphic violence and noise. Traveling with many packets of small ear plugs has served me well in Mexico and Central America. Individual ear plugs make for good trading items. Love this…so true about the buses…I learned that the hard way after a 12 hour bus from Medellin to Cali! FROZEN! Good tips on safety though. My boyfriend is Colombian so he is an expert in keeping safe and his tips apply to anywhere we go in the world. It doesn't matter where you are in the world, whether its Bogota or New York, it's how you act and what you do that will determine your safety. Really enjoying your posts on Colombia and your pictures are beautiful! Love hearing what other travelers think of Colombia as I love it and have written lots of posts about the country! Every time I hear about Colombia, I think of that movie "Romancing the Stone." It's good to hear that Colombia can be enjoyed for its natural beauty and not feared. Good tips about the hotel security. It's scary to think that it's so easy for random people to just walk in into some hotels I've stayed in. 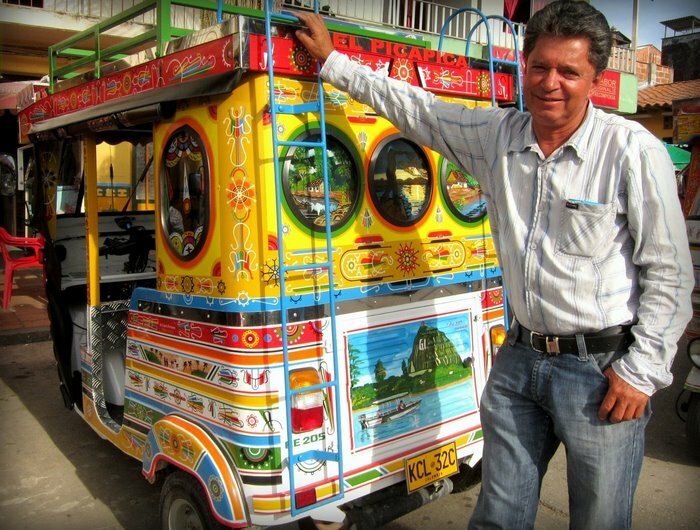 We never felt unsafe in Colombia at all – we were even used to the buses after a year in South America (the Bolivian buses are worse!). You are right though – the pueblos are the best part. Jardin and Salento are our favourites. I worked at a travel bookstore in Chicago in the late 90s and Columbia was the most dangerous country in the world then. It still may be dangerous in places, but it has come a long way. Thanks for sharing this you guys! I'd have to say that in South America in general this rule applies. My stint in Argentina left me FREEZING on buses (+ listening to 80s love ballads on full blast volume.. not as bad as serial killers though… although that Total Eclipse of the Heart video is kinda odd), and robbed in BsAs. I think it's all about just not being naive, but also looking for the right kind of adventure. Everywhere yout ravel is going to be dangerous if you're an idiot who thinks, "that'll never happen to me" lol. Good tips! My first solo trip overseas was to Medellin and needless to say, being an American, my friends and family thought I was crazy. I followed the rules though, such as don't walk alone at night, and never had any problems. I got some dirty looks walking around with a local girl I kind of dated while there, but that was about it. I felt very safe every time I visited Cartagena. The taxi drivers try to rip you off, but that's a taxi driver thing anywhere. Really good safety tips. I wouldn't have thought about needing an extra secure hostel, but that makes perfect sense. I'm surprised you noticed that particular richness of my country, because even here it's really hard to make people understand that true beauty (and eventual wealth) is more in the natural environments and less in the 'mall cities' that everybody – around the world- seems to wish. Nice article! I had similar comments about Colombia before going there. One family member told me that I was most likely going to be kidnapped "over there" and that I was silly for going. This is the image of 20 years ago that Colombia is still battling I think. I travelled the caribbean coast and into Panama, and I thought it was absolutely beautiful! Love Colombia…. especially Medellin but I agree totally on the food issue. how much grilled chicken can a person eat? go for the people and the climate of The City of Eternal Spring and forgive the culinary desert. I remember meeting people in hostels who'd been to Colombia when I was studying in Chile in 2005 and thinking they were crazy, but now it seems like everyone loves the country and that things have really changed. I can't wait to go!